Corey King Beaulieu (born November 22, 1983) is the lead guitarist, of American heavy metal band Trivium. He also performs lead and backing unclean vocals for the band at live shows. Born in Dover-Foxcroft, Maine, Beaulieu is the second of two siblings in the Beaulieu family. His older sister, Sandy, lives in Maine and works with horses. He is of French-Canadian descent. Corey attended high school at Foxcroft Academy in Maine where he played ice hockey. He studied guitar with Bill Pierce at the world famous Mark's Music in Brewer for 4 years. He was said to be the fastest shredder to study with Bill. "He worked harder than anyone I ever worked with." says Pierce. He was asked to join Trivium when he tried out for the band, after the release of their first album Ember to Inferno in 2003. Corey shares lead/rhythm guitar duties with bandmate Trivium frontman Matt Heafy playing some of the lead and melody sections when performing live. He is also a primary supporting vocalist in Trivium. He performed backing vocals for Taking Dawn in 2010. Later, in 2011, Beaulieu performed guest vocals on Maine metal band Rebirth To End's song "The Weakness Randomization." Beaulieu cites Yngwie Malmsteen, Joe Satriani, Steve Vai, Alex Skolnick, Kirk Hammett, Marty Friedman, Dave Mustaine, John Petrucci, Jeff Waters, Dimebag Darrell, Slash, and George Lynch as his primary influences. Corey Beaulieu performing in Nova Rock Festival 2014. In the past Beaulieu used mainly Jackson guitars such as the Jackson KV-2 Black Ghost Flames finish (as seen in Roadrunner United bonus DVD) and DX10D series occasionally using a B.C Rich Warlock and a Blue Ibanez guitar, until Rita Haney, partner of 20 years to Dimebag Darrell gave him and Matt Heafy each one of Dimebag's signature Dean guitars in the same year, later spawning a three-year-long endorsement with Dean Guitars, with Beaulieu sporting a black 7 string Razorback V with silver bevels. He also had a signature model V. This V is metallic red with the Trivium circle logo placed between the bridge and neck pickups and is also fitted with a Floyd Rose Locking Tremolo and a Seymour Duncan Dimebucker. He left Dean guitars in the summer of 2009, for the Throes of Perdition video he was back to playing a Jackson King V. After talking to several guitar companies, including DBZ Guitars, and using a variety of guitars live, including a Jackson King V, and an ESP DV8 Dave Mustaine Signature, Corey has signed with Jackson Guitars. He has recently been seen playing various custom Jackson V guitars and is in talks with Jackson regarding the development of a signature guitar. 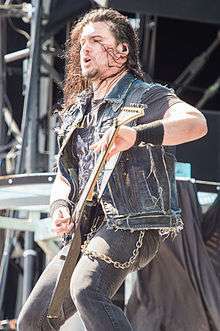 His new Jackson Prototype Signature Guitar can be seen in recent live performances and in the Video for Trivium's new single for the God of War III soundtrack, "Shattering the Skies Above". In a recent statement on Facebook however, he stated that his new signature Jackson would be a traditional flying V shape, with no Cut-outs.It will have Seymour Duncan Blackout active pickups. Corey has released a video on YouTube entitled, "Corey Beaulieu: Guess What's Coming?," where he shows off a prototype of his new signature Jackson V. He states that he will have 6-string and 7-string variations of his signature V. At the 2013 Winter NAMM Show, Jackson officially released Corey's Signature Guitar. Available in 6 and 7 string variants made in the USA only. Dunlop 10-52 for 6 string guitars. Dunlop 10-52 custom set with a 63 for the low B string on 7 string guitars. Recorded Melody Guitars and Guitar Solos on Lizzy Borden's 2007 studio album, Appointment with Death on the track "Abnormal". Rebirth To Ends - The Weakness Randomization (unclean vocals). ↑ "Archived copy". Archived from the original on 2008-01-23. Retrieved 2008-01-19.